Shameless begging gangs are making children as young as three hug strangers in the street until they hand over cash, MailOnline can reveal. 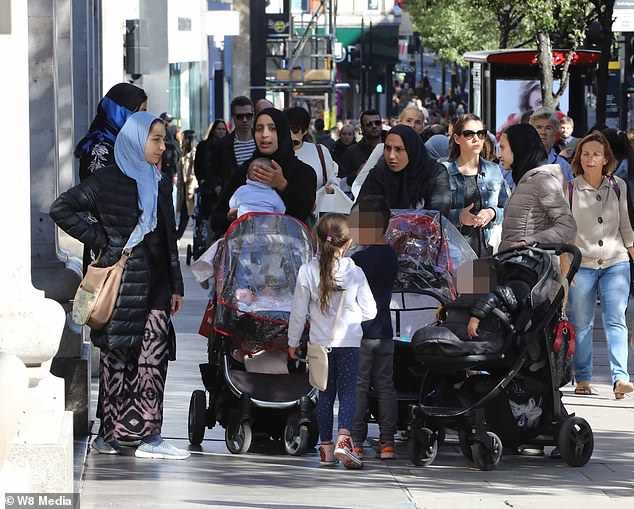 Shocking footage, obtained by MailOnline, shows the youngsters targeting wealthy shoppers along London's Oxford Street. They hone in on well-dressed members of the public and fling their arms around the waists of their startled victim in the hope they will be given money to go away. Any cash given to them is immediately handed over to an adult guardian. These modern day Fagin-style gangs operate a half a mile stretch of Oxford Street between Marble Arch and Bond Street tube station entrances, focusing on the world-famous Selfridges department store. 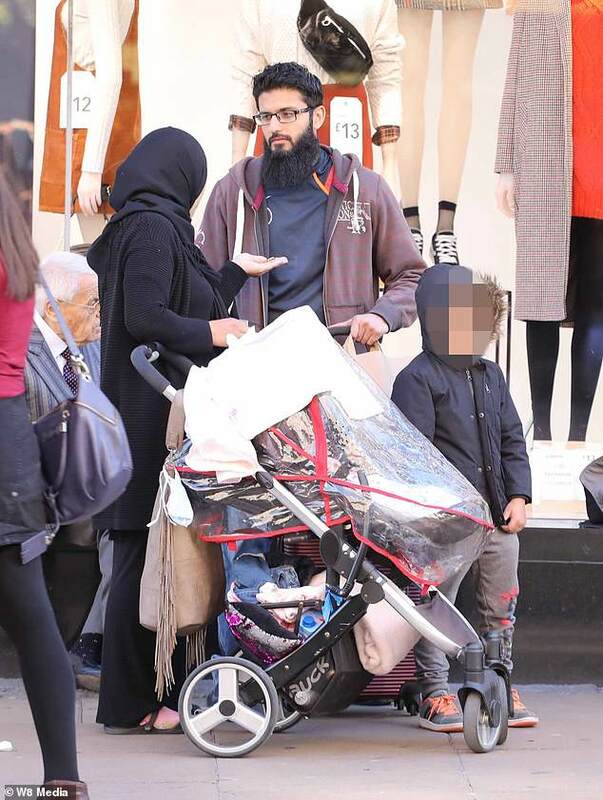 A woman pushing a pram is pictured begging for money from a male shopper along with her school-age children. Kids were filmed hugging their victims and asking for their cashEach child is accompanied by two or three adult women who walk slowly behind, watching for police, security guards and other potential targets. Often they approach the person who is being cuddled and gesture for them to be given money to feed the child. Some victims are so desperate to be let free they give the children £50 notes just to get rid of them. The gangs, who arrive into central London early in the morning apparently from Ilford in Essex, can make as much as £100,000 a year begging, police say. The MailOnline filmed one group target two smartly dressed tourists walking between Marks and Spencer and Selfridges. In the footage a boy of school age, around seven-years-old, clamps himself around stunned tourist Shanice Braithwaite for nearly 20 seconds as she waits to cross the road. A woman with a pushchair hovers beside him and holds out an open palm for money. 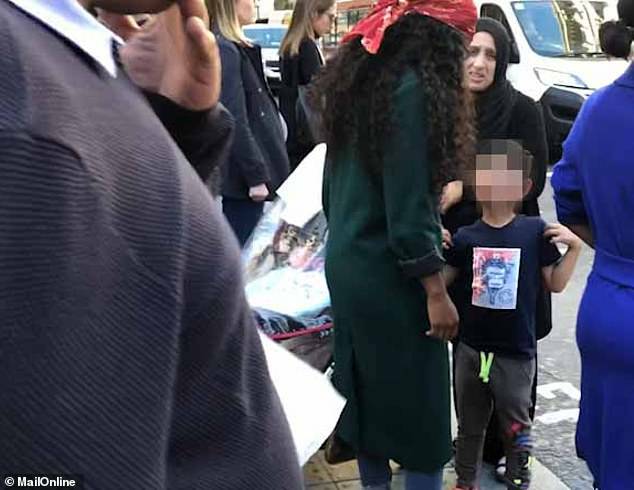 Afterwards, Shanice, 28, who is visiting London with her friend from Barbados, said: 'This little boy came up to me and put his arms around my waist and asked if I had any spare change. 'I told him that I don't normally have cash and pay for most things by card. 'He kept his arms around me for a while and I wondered what was going on. Nothing was stolen because I checked straight away. About an hour earlier a little girl, aged no more than three-years-old, had been made to try the same trick. 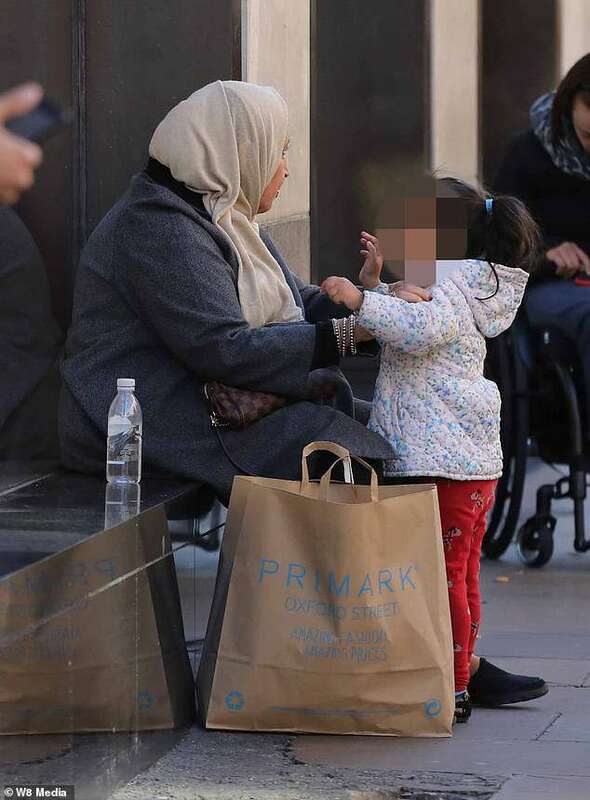 She had been ordered to approach shoppers sitting on a small ledge outside the Primark clothing store on Oxford Street. The girl then reaches out and tries to hug one woman, but is shooed away. She tries again and hugs another woman sitting nearby, who is chatting on the phone, but again ends up empty-handed. 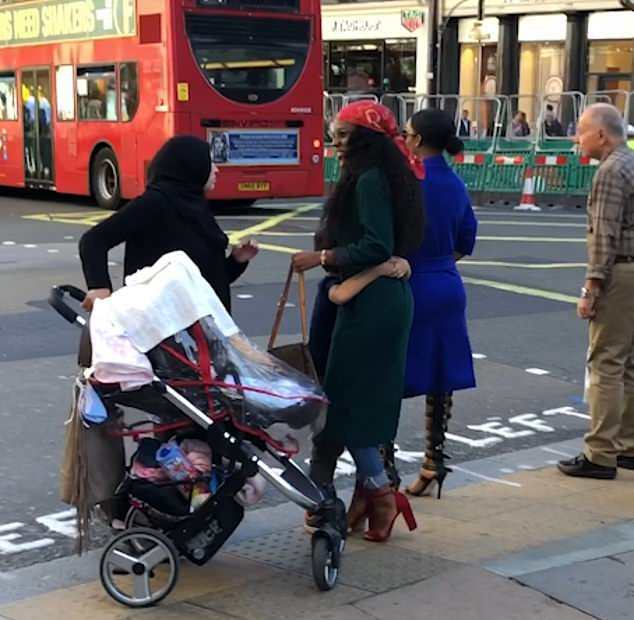 Like with the young boy, a woman flanks her throughout with a pushchair holding her hands out pleading for money. Further down Oxford Street towards Debenhams, they order an angelic blonde-haired girl of about five or six-years-old to approach Middle-Eastern customers. 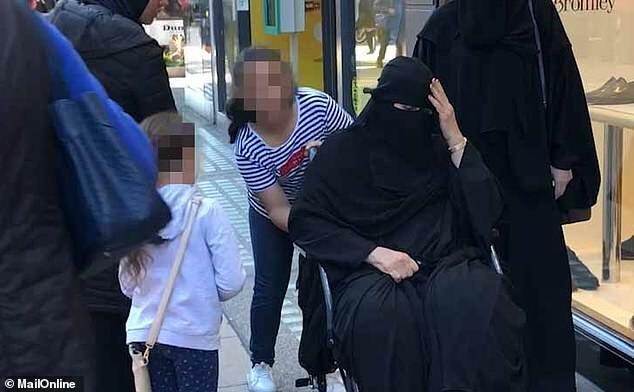 She tries to stop two men in their stride by pleading for spare change, tugs at a woman's mobile phone and accosts a wheelchair-bound woman wearing a full veil who warns her off. Watching the begging gang as they approach Selfridges, one of the department store's doormen, who asked not to be named, said: 'They are around here every day and they are now so brazen. 'We've nicknamed them 'hugger muggers' because they come out of nowhere, start hugging someone and won't let go until they hand over some cash. 'I've seen people give these kids £20 and £50 notes, either out of pity or to make them leave them alone. 'So for the gangs manipulating these youngsters, it can be a real money-spinner. 'They usually target Muslim or Arab shoppers, particularly those who look like they have a lot of money. 'They'll speak a little Arabic to them to try and charm their victims into parting with their money. 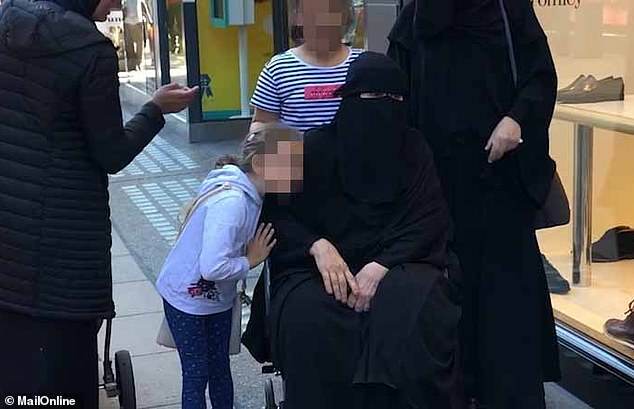 Speaking on the guarantee of anonymity, an Oxford Street stall holder told how the youngsters were part of a professional criminal begging network, which also includes men pretending to be disabled. The businessman said: 'I spoke to one of the beggars once and asked why they did it. 'She said that they come to London for a few months and are then sent somewhere else. 'But it's not right because some of the children they use should probably be in school but are instead dragged up and down Oxford Street all day long to beg in all weathers. 'And sometimes they're not just hugging people to beg for money, we've had people approach the stall asking us if we've seen their purse or phone and its usually after they've given money to one of these youngsters. 'Yet if you challenge them, the adults in the gangs can turn really nasty. 'We've tried to move them away from begging around the stall and it's resulted in us being spat at, sworn at and pelted with bits of food and other missiles. The stall holder added: 'They are part of a big group of beggars, who include two men who hobble around on crutches pretending to have uncontrollable shakes. The Metropolitan Police say they are aware of reports of anti-social behaviour and begging on Oxford Street. A spokesman said: 'In order to deter criminality, officers in Westminster deploy a number of tactics including high-visibility patrols as well as plain-clothes operations, whilst offering crime prevention advice to residents, visitors and local businesses.